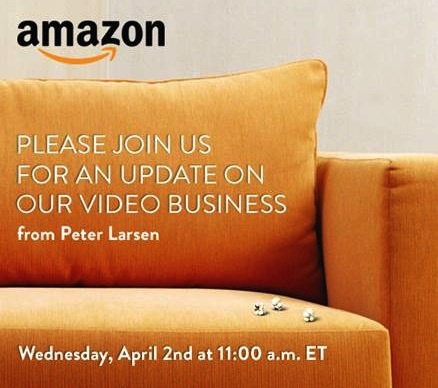 Following rumors of a March launch, it looks like April 2 will be the day Amazon introduces its Apple TV competitor, as Re/code notes that the company has sent out invitations to a "video business" media event for that date. The invitations feature a photo of a couch and popcorn, strongly suggesting that the event will indeed involve the rumored streaming video device, and Re/code's sources indicate that this will indeed be the topic for the event. The e-commerce giant has invited reporters to gather for an “update for our video business” in New York next Wednesday, April 2. The popcorn and couch in the image give you a pretty good idea of what to expect, as does our previous reporting, which explained that Amazon has been preparing a Web-to-TV gadget for many months. A recent report from TechCrunch indicated that Amazon's device is expected to be a dongle similar to Google's Chromecast, which plugs directly into an HDMI port on the back of the user's television and then connects to either a USB port or outlet for power. Amazon's launch comes as Apple users continue to await the introduction of a revamped Apple TV. Rumblings had suggested Apple was considering a launch late last year, but nothing materialized. Newer rumors have suggested that Apple might make a March or April announcement ahead of a launch later in the year, but there have been no specific signs of an imminent event from Apple. The more options for people to move away from cable/satellite the better. Thank you amazon, quite happy with my apple TV. Despite being an amazon 'prime member' I detested love-film, and am quite happy and content with my current iTunes/icloud set-up. I suspect those not in a matrimonial union with iTunes-family may be swayed; personally, i do not see this as a viable alternative for my needs and usage. The couch is quite ugly. Ugly image lol Looks like something a school pupil would make. Never cared much for the Amazon Prime Movies. Nor do I want to buy any that weren't free. I only enjoyed watching past TV episodes but I won't be renewing this year since I don't buy that much from Amazon anymore. Following Amazon's current naming strategy, we can all be anticipating the Amazon Kable Fire! Wow! Judged & rejected without even seeing what it is. Wow! One cannot judge whether something unseen & unknown is a viable alternative for one's needs (unless one thinks this is about an orange couch or used popcorn). For all we know it might be a gateway to everything ever made in 4K or 8K able to be viewed on any device (Apple or not) for free if you've ever bought one thing from Amazon? Probably not, but no one can know or judge- even for themselves- until they at least see what it is. Something new? Not from Apple? It must be bad. Not for me (or you either). Something new? From Apple? Shut up and take my money! I'm already in line. How did we ever get by without this? Competition is good- even for Apple. I hope whatever this turns out to be is WOW, WOW, WOW great!! !